After his coronation in 1066 William the Conqueror claimed that all the land in England now belonged to him. William retained about a fifth of this land for his own use. The rest was distributed to the those men who had helped him to defeat Harold. In return for these lands (fiefs), the 170 tenants-in-chief had to provide men for military service. The number of knights (horse soldiers) tenants-in-chief had to provide depended on the amount of land they had been given. In order to supply these knights, tenants-in-chief (also called barons) divided some of their land up into smaller units called manors. These manors were then passed on to men who promised to serve as knights when the king needed them. William gave a quarter of the land in England to the church. Bishops, abbots and priors that were granted land also had to promise to supply knights. For example, in exchange for his Mild flie archbishop of Canterbury had to provide sixty knights when the king wanted them. When William granted land to his tenant-in-chief an important ceremony took place. The tenant-in-chief knelt before the king, placed his hands between the king's and said: "I become your man," swearing on the Bible to remain faithful for the rest of his life. The tenant-in-chief would then carry out similar ceremonies with his knights. To break this oath was a very serious crime in Norman England. (Source 2) Kettering Abbey provided land for forty villeins. In exchange for holding 30 acres the villeins had to provide several feudal services. Kettering Abbey provided land for forty villeins. 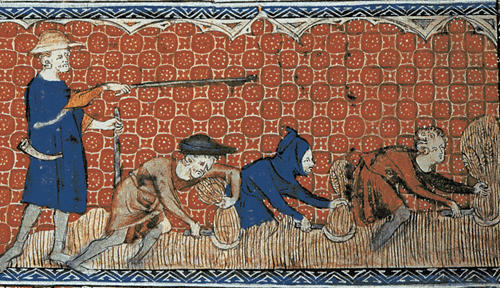 In exchange for holding 30 acres the villeins had to provide several feudal services. Three days a week work on the 88 acres held by the abbey. Every year they had to provide 50 hens, 640 eggs and 2s. Id. in cash. 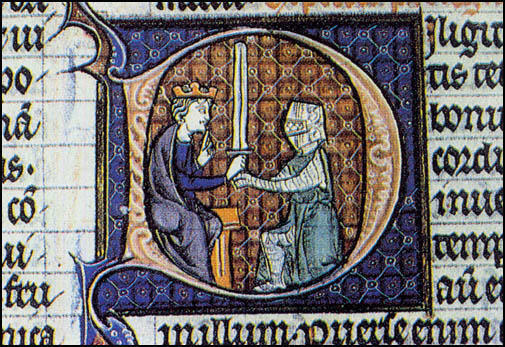 I am letting you know by this letter that I hold from you a certain village, Gosford by name, and the half of another which is called Milton, for the fee and service of one knight, which I faithfully perform for you, as my ancestors. (Source 6) Pope Gregory VII in a letter to the Bishop of Metz in 1081. Kings and leaders are sprung from men who were ignorant of God, who by pride, robbery, murder, in a word, by almost every crime in the devil... to dominate over their equals, that is, over mankind. He who swears fealty to his lord must not injure his lord by giving up secrets of his castles... he must do nothing to injure the rights of justice of his lord... he must do no wrong to his lord's possessions. It is the custom in England, as in other countries, for the nobility to have great power over the common people, who are their serfs. This means that they are bound by law and custom to plough the fields of their masters, harvest the corn, gather it into barns, and thresh and winnow the grain; they must also mow and carry home the hay, cut and collect wood, and perform all manner of tasks of this kind. Question 1: Explain why Earl Warenne (Source 4) produced an ancient sword when he was asked by the judges to show his warrant. Question 2: Select a source from this unit where the author appears to support the feudal system. Also select an author who appears to be critical of this system. Explain your choices. Give reasons why these two writers had different opinions on this subject. Question 3: Compare the value of the sources in this unit in helping you to discover how long feudalism lasted in England.